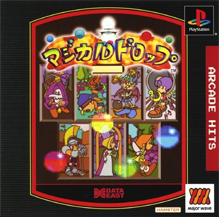 Arcade Hits: Magical Drop was delisted from the US PlayStation Store the week of August 13th, 2012 alongside other MonkeyPaw Games releases: Kyuiin, Yakiniku Bugyou and Magical Drop F. The reason is unclear but MonkeyPaw has stated numerous times on twitter that these games were “delisted by Sony and won’t be coming back” and that the delistings were “permanent” as far as they were concerned. While all titles were published in Japan by Hamster it doesn’t appear to be a licensing deal or conflict between the two. There are several other Hamster releases currently published by MonkeyPaw that are still available on the PlayStation Store in the US and Europe. Yakiniku Bugyou and Kyuiin were both developed by Media Entertainment, Magical Drop by Data East and Magical Drop F by SAS Sakata, ruling out a complication with a single developer. The reason for the mass delisting in August 2012 is uncertain but in the end it is most likely a licensing issue. In the same Techno Buffalo interview Olsen says that licensing “is incredibly tricky to navigate in Japan and you need to be persistent and persistent and persistent until you hear a ‘Yes.’” While they were able to strike deals to release these games the terms may have been less than desirable, resulting in availability between only 9 months and just over 2 years. “Magical Drop is a Tetris-inspired puzzle game featuring characters from tarot cards as players. A stack of random colored bubbles descends from the top. Players pull bubbles down, shifting the colors and toss them back up into like-colored bubbles, making the whole chain disappear.